Sacred energy sites, ascension activations and galactic awakening. AN ASTOUNDING EXPERIENCE of energetic transformation and Ascension particles convergence. Soul by soul, we are co-creating a transition to a new reality. With each elevation in planetary energies, there are new openings to release soul-level blocks and receive new life potential, individually and collectively. In support of this uplift, we travel worldwide to key high vibrational nodes, gateways of galactic consciousness and ancient sacred energy sites. Join us in Egypt and bring your 5D timeline closer to you, in bathing into a high vibrational land, lay lines and vortexes of innate wisdom, reconnecting to your Divine essence and awakening your DNA Ascension template. 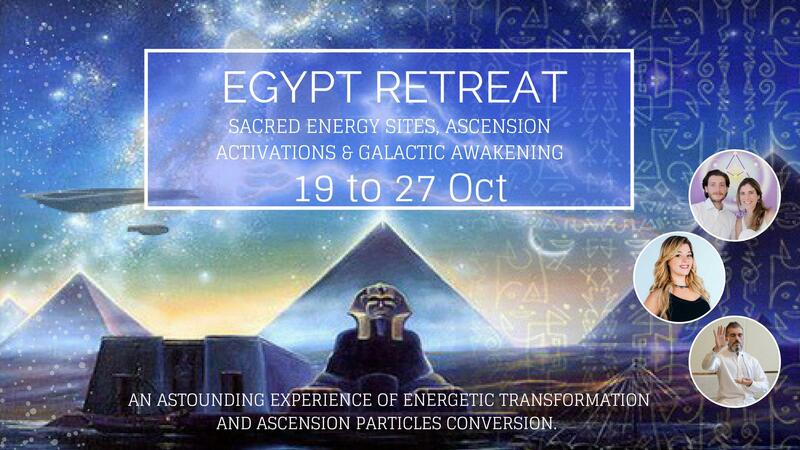 This Egypt Retreat is primarily to align new frequencies, clear energetic disruptions, re-awakening dormant DNA, activate your Diamond Light Body, expand cosmic connections for ascension activations and to open dimensional gateways, for both individual souls realization and planetary consciousness. In which you will be submerged in DNA upgrades, galactic awakening, downloads, healings, activations, and ascension teachings-remembering. Where you will be immersed in pure high frequencies in everything you do. This is an invitation to participate in a full spectrum of releasing and upgrading of mind, bodies, heart and soul. It will be an experiential immersion, clearing and activating your carbon based cells into their crystalline form which holds more of the higher frequencies and light. If this excites you and you feel ready for the trip of a lifetime, register in this event to receive the entire itinerary, brochure and application form. Obviously for this trip we have limited numbers so if your feelings are aligned and you would like to be part of these catalyst powerful 8 days; follow the link to lock down your place in our spaceship. Note that the early bird price is only available up to the 27th of August. We will be visiting 13 temples and initiation chambers through Egypt from Cairo to Aswan and doing excursions including all the major temples. Such as Giza Plateau, Serapeum of Saqqara, the temple of sound and light in Dashur, Karnak, Luxor, Dendarah and Hathor Temple, Osirion temple, Edfu and Horus Temple, Isis Temple, through private boat cruise, private bus and felucca sailing with an awakened egyptologist tour guide available. We are opening the sacred retreat for committed souls and activated pillars of light, who want to access their own Inner Wisdom. So ideally you have done some training and have enough experience with energy and vibration as you will embody further your gridprogammers roles. Book your spot on this galactic spaceship DNA activation Retreat. Fill in the Registration Form attached in the email you will receive and send it back to: galacticretreats@gmail.com. 4 cosmic channels, spiritual teachers, ascension guides, lightworkers, Love alchemists and gridprogramers. -> For the detailed itinerary, register in this event to receive the brochure and application form. We start with Asil’s group channeling session in the evening. Morning we visit Egypt Museum. In the afternoon we discover the Giza Plateau and Sphynx. With a special Privatisation of the King’s chamber in the Great pyramid. and then in the afternoon we drive to Saqqarah to visit Serapeum. Visit of Temple of Seti & the Osirion, with the Flower of Life. Karnac Temple with a special activation-transmission in Sekhmet chapel (the Solar Lioness Goddess) and at the seven dimensional gateway of Osiris. Afternoon we visit Luxor temple. We start sailing up the Nile. In the afternoon, we are in Aswan visiting and sailing around nubian Islands in felucca boat. Sunrise visit to Isis Temple in Philae. An afternoon for integration with Galactic Breathwork activation and silence. A bus will drive us to the international airport catching an early flight from Aswan to your 3D Home (there will be a connection flight in Cairo international Airport). Many blessings to your heart, for choosing to dedicate yourself to this journey of ascension awakening and grounding your spiritual light into your beautiful physical body. We look forward to meeting at this contracted soul appointment sharing this exquisite experience and deep work together, and we are honoured to be your guides in your retreat within in this time of remarkable transformation. From our Hearts to yours. With Love and Golden Diamond Light.